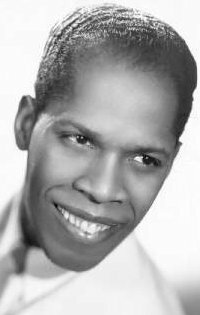 "I'll Lose A Friend Tomorrow"
Above Left: Photo (dated 1946) of Bill Kenny, tenor lead singer of The Ink Spots (starting in 1936). 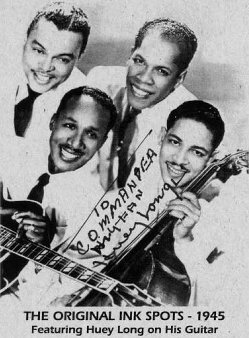 Above Right: Photo (dated 1945) of The Ink Spots. Top (L-R) Billy Bowen, Bill Kenny, Bottom (L-R) Huey Long, Herb Kenny. These were the group members when "I'll Lose A Friend Tomorrow" was recorded in 1945. Huey, who replaced Bernie Mackey, remained with the group for about a year until Charlie Fuqua returned from a stint in the army. Billy Bowen had joined the group in late 1944, Herb Kenny in 1945... both staying for a number of years. Above: Decca 24261 Label. Recorded 10/02/45; Released 11/47. 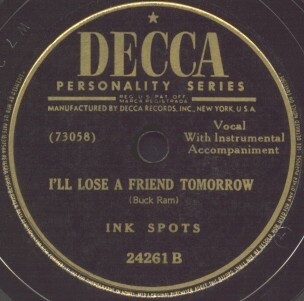 In 1947, there were fourteen Ink Spots' records released... several using their earlier material. Composer is Buck Ram, who later managed The Platters and The Penguins. Click on an option below to listen to "I'll Lose A Friend Tomorrow" by The Ink Spots using RealPlayer.